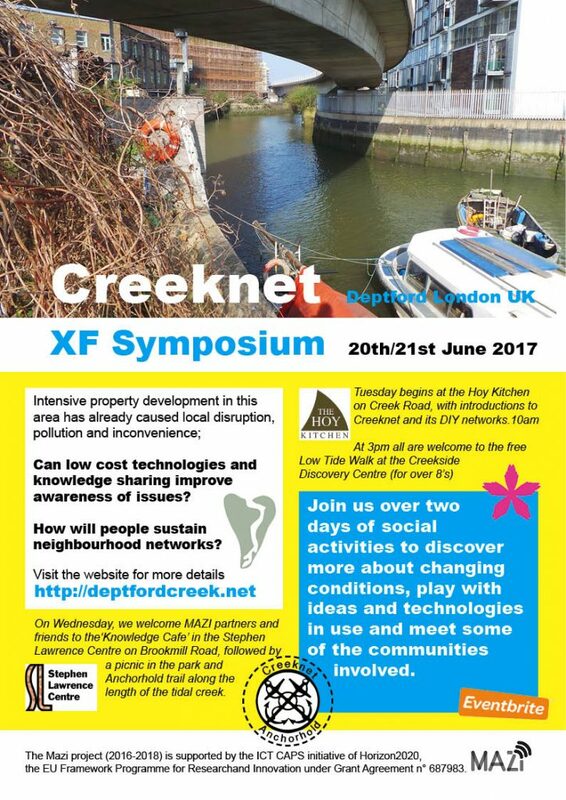 All are invited to two days of public meet ups and workshops to exchange ideas and explore the DIY networks of Deptford Creek. Tuesday 20th at Hoy Kitchen on Creek Road SE8 3BU, followed by a free Lowtide Walk at Creekside Discovery Centre SE8 4SA. Wednesday 21st June at Stephen Lawrence Centre on Brookmill Road SE8 4HU, followed by a picnic in the adjacent Brookmill Park. We welcome MAZI partners from around Europe to meet friends and contributors in SE8 and beyond. Creeknet is one of four MAZI pilots, helping people face local challenges together, supporting network development, sharing resources and promoting sustainability. This entry was posted in Creeknet: London, Events. Bookmark the permalink.